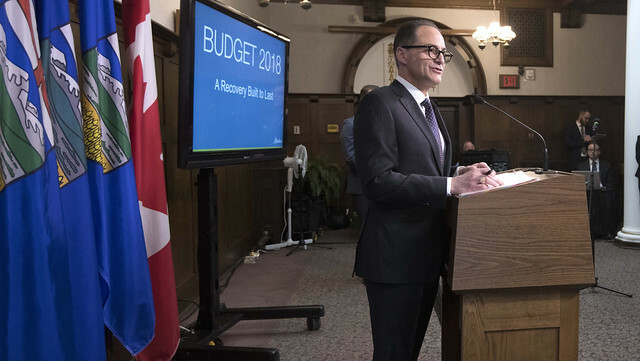 Read the speech delivered by Finance Minister Joe Ceci to introduce the provincial government's 2018 budget. I am pleased to present Budget 2018. Before I begin, I would like to acknowledge that we are gathered here on the traditional territory of Treaty 6. I would also like to acknowledge the Métis people of Alberta, who share a deep connection to this land. This budget is based on extensive consultations with Albertans and it reflects their priorities. I want to thank Albertans for their constructive and thoughtful input. Alberta’s economy is coming out of the worst recession in generations. When the global price of oil collapsed and the recession hit, we had a choice: Cut or build. In making that choice, we focused on the priorities of regular people and families – creating badly needed jobs, building our province for the future, making life more affordable for people and protecting the schools, hospitals and public services all Albertans rely on. Today, in Alberta, things are looking up. Jobs are up: 90,000 last year. Alberta’s economy is growing – faster than any province in Canada. And the budget deficit is coming down. Though we have come a long way from the recession’s low point, there is still much more to do. That’s what Budget 2018 is all about – making sure this recovery is built to last and built for working Albertans. To set the context, let me begin today by looking more closely at the economic recovery underway in Alberta. In 2017, Alberta’s economic rebound surpassed expectations. Real GDP grew an estimated 4.5 per cent, with nearly every sector expanding. Exports increased by nearly 30 per cent on rising oil production and an expanded manufacturing base. Housing starts grew by 20 per cent. Retail sales expanded by 7.5 per cent. Rig activity jumped 66 per cent. And the labour market strengthened throughout the year. Not only that, Mr. Speaker, Alberta also outperformed the rest of the country on a number of key economic metrics – the highest per-capita GDP, the highest average weekly earnings and the highest employment rate in the country. An improving economy supports an improving fiscal picture. This forecast is based on an economic growth projection of 2.7 per cent and an oil price of $59. These forecasts are in line with those of the private sector. In short, following a very difficult recession in Alberta, today jobs are up, the deficit is coming down, and our economy continues to grow. With that economic momentum, we can continue on our path to balance by 2023. For too long Alberta has been locked in a cycle of boom-and-bust spending that tracked the price of non-renewable resource revenue. Earlier this decade, when oil prices were high and the economy was growing, the budget remained unbalanced and savings were not put aside for the future. Between 2010-11 and 2014-15, for example, oil prices averaged $90 a barrel, while the economy grew more than five per cent per year – more than double the national average. Yet, over this period, the government ran deficits in all but one fiscal year. Boom-and-bust spending was inefficient and unstable. Upon taking office, our government set out to fix this. We embarked upon a thoughtful and strategic plan to smooth out the wild spending swings that characterized budgeting in Alberta. First, we restored progressive taxation, asking the top seven per cent of income earners to pay a little more to support health care and education. Second, we raised the general corporate tax rate by two percentage points to 12 per cent. And third, we implemented an economy-wide price on carbon. With Alberta’s economy in recession, every dollar raised through the carbon price was reinvested in the economy in rebates, infrastructure investments and initiatives to lower greenhouse gas emissions and improve energy efficiency. Even with those changes, Albertans and Alberta businesses pay at least $11.2 billion less in taxes than they would in any other province. Alberta’s tax advantage is secure. Today, with the private sector gaining momentum, these important and long-overdue tax reforms will help reduce our over-reliance on non-renewable resource revenue. Revenues from corporate and income taxes are forecast to grow by as much as $1.2 billion, with the amount increasing over time as our economy grows. Moreover, as our economy relies less on government stimulus, additional carbon revenue will help contribute to an improving bottom line. Beginning in 2021, additional revenue resulting from the federally imposed carbon price tied to the construction of the Trans Mountain Pipeline will be used to support vital public services as the province stays on track to balance the budget by 2023. This is an important step in the direction of stable, predictable budgeting that this province needs. But to succeed, it must be joined by other measures to keep spending growth down to stable and manageable levels. First among these is the government’s ongoing effort to eliminate waste and find efficiencies without compromising core public services. It is no secret that by 2015 many spending priorities had become severely distorted. The Sky Palace a few hundred metres from here is only the most high-profile example. Less well known were the golf club memberships handed out to highly paid executives and an ever-growing alphabet soup of agencies, boards and commissions. The same goes for annual government hospitality bills. From the beginning, the government has worked to tackle this legacy and bring down costs. We eliminated perks such as golf club memberships. We slashed travel and hospitality expenses. We introduced sunshine laws to open up the books on public salaries. We eliminated or consolidated 26 agencies, boards and commissions. And we slashed exorbitant salaries at those ABCs, with some executives seeing their salaries cut by hundreds of thousands of dollars. In Budget 2018, that work continues. This year we are extending our salary review to post-secondary executives and school superintendents. We are keeping tight control over discretionary spending with restrictions on travel, conferences and hospitality. And we are consolidating services such as communications, information technologies, finance and human resources. This work is important not only for the money it saves, but also for the trust it builds. To work effectively, government must demonstrate that the money it spends is spent efficiently and on things that matter to everyday families. An effective government is also one that responds quickly in an economic crisis. When the oil price collapse hit, tens of thousands of Albertans were thrown out of work. On taking office, the government took the advice of former Bank of Canada governor David Dodge and injected stimulus into the economy by dramatically increasing spending on infrastructure, developing a capital plan that led the country in investment. This made economic and fiscal sense. Interest rates were low, the economy was depressed, and Albertans needed work. As a result of the government’s infrastructure investments, tens of thousands of jobs were created and supported. And Alberta will have the modern economic and social infrastructure we need to compete and win in the global economy and build strong communities. Today, with our economy growing and the private sector creating jobs, we continue to follow Dr. Dodge’s advice. It is time to rein back capital spending to more normal levels. Last year’s capital plan budgeted $29.5 billion over four years. This year’s capital plan returns to more normal levels of spending – $26.6 billion over five years – and makes good on previous promises while promoting growth through strategic infrastructure investments. Reductions are being achieved by extending capital grants across the five years of the capital plan. Capital project cash flows are being closely managed to reduce borrowing costs. Budget 2018’s measures to scale back capital expenditures are joined by the government’s ongoing efforts to manage public service compensation in the interest of all Albertans. Alberta’s public servants work hard every day to make life better for people and to protect Albertans. The government has already reached practical agreements with no raises and better job stability with many labour partners, including teachers and nurses, and a tentative agreement has been reached with our allied health professionals such as paramedics, lab technologists and X-ray technologists. As negotiations in other sectors advance, we will continue to take the same practical approach that values our public service providers and recognizes the province’s fiscal realities. In addition, Budget 2018 continues the freeze on salaries for non-union staff across the public sector until September 2019 and it keeps the growth in the public service flat with new hires focused on front-line service delivery. Taken together, these steps will keep Alberta’s economy growing and on a path to balance by 2023 without reckless measures that would hurt families and harm the recovery. Budget 2018’s path to balance is supported by realistic and achievable spending and revenue targets built on the best available private-sector forecasts for oil and economic growth. And it is leading toward a stronger, more secure future. To balance our budget and stabilize our finances, we must continue to diversify our economy and create good jobs for Albertans. This is the top priority of Albertans and it is the top priority of this government. While 2.3 million Albertans today have work – with more people working in Alberta than at any point in our history – the economic recovery has not reached each and every household. An economic recovery that fails to reach every Albertan is no recovery at all. The economic recovery must keep going, our economy must keep growing and more good jobs must be created. To do that, we must move on all fronts. We must get top dollar for the energy resources we export. We must get more value out of our energy products here at home. We must support new and emerging industries. We must continue to diversify our agricultural markets and build on our growing strength in agri-foods. And we must make sure Albertans have the training and skills they need to get the jobs of tomorrow. We have secured the approval of critical energy infrastructure projects, such as the Keystone XL pipeline, Enbridge’s Line 3 replacement and Kinder Morgan’s Trans Mountain Pipeline expansion. We backed Keystone XL with a commitment of 50,000 barrels a day for 20 years. Construction on Line 3 has begun. And we are leading the fight to build the Trans Mountain Pipeline with the full support of this chamber. We will continue to make sure construction on the Trans Mountain pipeline expansion begins without undue delay and that our constitutional rights are respected as partners in Confederation. When complete, these pipelines will provide critical market access as oil sands production rises and emissions remain capped, supporting new investment and jobs. The addition of these pipelines is forecast to lift Alberta’s GDP by about 1.5 per cent to two per cent by 2023. As our economy grows with diversified export markets, we will continue to work with our energy industry partners to diversify our energy sector, encouraging more value-added production. Budget 2018 begins our commitment to a new round of investments in the Petrochemical Diversification Program, along with partial upgrading and the Petrochemical Feedstock Program. These investments will support up to $13 billion in new investment. More importantly, these programs will create good jobs, continue to help diversify our energy sector, and allow us – as Albertans and owners of this resource – to generate more wealth and value here at home. Beyond our energy sector, Budget 2018 helps businesses hire and grow and helps students train for the jobs of tomorrow. The Alberta Investor Tax Credit and the Capital Investment Tax Credit will be extended to help even more businesses grow and attract investment. The new Interactive Digital Media Tax Credit will make Alberta a more competitive place for our growing and exciting interactive digital media industry. To make sure Albertans can get the skills they need for good careers in our growing technology sector, we are creating 3,000 new post-secondary technology spaces and new scholarship programs to support technology and other emerging sectors. Budget 2018 provides $6 million to begin investing in 3,000 new technology-related, post-secondary program seats, which will grow to $43 million per year by 2022-23. These training and diversification measures will take place in the context of an economy that has already benefited from major capital investments during the height of the downturn. Hundreds of new schools are either built or being built. A new cancer centre is being built in Calgary and a new hospital is being planned in south Edmonton. The construction of the Green Line in Calgary is the single largest public infrastructure project in the city’s history and it will create tens of thousands of jobs. And across Alberta, highways are being made better and safer, bridges are being built and strengthened, and new infrastructure is making it easier for people to get around in our growing province – all the while creating thousands of good jobs. Albertans have been clear: Bring the budget back to balance while protecting the things that matter to ordinary people. Albertans deserve a balanced plan for a secure future, one that carefully and responsibly controls costs while protecting services. From Day 1, we resisted calls to respond to the oil price collapse by making deep cuts to hospitals and schools. Instead, we made sure Albertans would have the services they need, when they need them. Budget 2018 takes the same approach. I am proud that we have built hundreds of new schools for our kids and for future generations. These investments create good construction jobs in the short term and modern spaces for our kids to grow and learn in the long term. In Budget 2018, nearly $400 million has been allocated to build more badly needed new schools for our children. This budget includes 20 new schools, including support for new schools that will primarily serve Indigenous students. These new schools are backstopped by our commitment to continue funding enrolment growth, which will add 600 new teachers and 300 new support workers to Alberta classrooms. This year we will also expand our school nutrition program. When the school nutrition program began, it helped to make sure 5,000 young Albertans got a healthy meal while at school. This year, that program expands to 30,000 students, helping more kids across our province focus on their studies and not their hunger. People come to our colleges and universities in search of better lives. A well-funded post-secondary system is vital to making sure our province can help people get skills and keep people working here in Alberta. For Albertans who decide to get trades training or pursue a degree at the growing number of degree-granting institutions in Alberta, we are in their corner. In addition to thousands of new spaces in technology, as well as dedicated new scholarships, funding for post-secondary education will remain stable and predictable, with an increase of two per cent over last year and an additional $17 million to support the tuition freeze. More Indigenous people will be able get the skills they need to build the futures they want with more support for Indigenous training providers and targeted financial supports for learners. And with Grande Prairie Region College and Red Deer College beginning the work to become degree-granting institutions, people in northwest and central Alberta will be able to get a degree closer to their homes and families. Albertans depend on getting quality health care when they need it. Spending on health care will increase this year by three per cent. In addition to making sure our front-line health professionals have the stable, predictable funding they need to care for Albertans, these funds will also increase support to combat the opioid crisis, increase support to combat substance use, and increase support for mental health. As we protect and support our schools and hospitals, we will do more to help keep children and families safe. Support for child protection will increase. With a $60-million increase over last year’s budget, more than $800 million has been allocated this year towards strengthening the child intervention system. These funds support the work of the all-party committee and will deliver both prevention and intervention programs to help keep young Albertans safe. To better help working families emerge from the downturn, we will continue to make their lives more affordable. This year, more new moms will have an easier time joining the workforce and more young families will benefit from affordable child care. We are expanding upon and learning from our $25-per day childcare pilot program. This year, we will create an additional 4,500 affordable childcare spaces across Alberta. More needs to be done to bring affordable child care within reach for more families and we are committed to continuing this important work. At the same time, the Alberta Child Benefit will continue to make life more affordable by providing direct financial assistance to lower-income families, and the Alberta Family Employment Tax Credit will continue to help lower- and middle-income families make ends meet. From the day this government took office, through recession and now into recovery, we have strengthened and improved supports that make life better and more affordable for families. In making sure this economic recovery is built to last and built for ordinary people, we must make sure that more families emerge from the downturn stronger and more secure. This budget helps families do exactly that. Budget 2018 also makes communities and families across the province safer. When it comes to crime, especially in rural areas, we have heard the concerns of Albertans loud and clear. That’s why we are taking action to ensure they feel safe in their communities. Together with the RCMP, we launched a new rural crime strategy. This strategy put more boots on the ground in rural areas by expanding the RCMP’s Rural Crime Reduction Units, which focus on putting thieves behind bars. We are adding new supports to keep more police in their communities rather than sitting behind their desks. We are hiring more Crown prosecutors focused on rural crime, hiring additional intelligence coordinators to track offenders, utilizing GPS technology to catch thieves in the act and supporting citizen-led crime watch and patrol groups. That work will be bolstered by the new police officers funded by this budget. All Albertans should feel secure at home, from our biggest cities to our smallest towns, and we will keep supporting our police. Women in Alberta should also feel secure. Too many women do not have the supports and services they need to come forward and find help after an assault. For that reason, we are significantly increasing support to help survivors of assault. More than $11 million will be provided to the Association of Alberta Sexual Assault Services to expand counselling and crisis support. Affordable housing is a key building block to security and stability for people and families. More needs to be done to improve existing facilities, build new ones and help seniors and families with this most basic need – a warm, safe place to call home. We will continue to make sure that our affordable housing units contribute to healthy lives and healthy communities. This budget also increases funding for seniors housing, so more of our neighbours can live with dignity and safety. And it commits to building new affordable housing across Alberta. In Calgary, Edmonton, Fort Saskatchewan, Lethbridge, Medicine Hat, Red Deer, Slave Lake and Whitecourt, we will build roughly 400 new units. These will be good new homes for seniors, youth in need of security, people with disabilities, and people prone to periods of homelessness. As our population ages and grows, the need for affordable housing grows too, and this budget continues our commitment. During the recession, we stood by our municipalities to make sure they could continue to deliver high-quality services for their residents. As we dial back our capital spending to reduce our debt burden and reduce our borrowing costs, the government will make changes to the Municipal Sustainability Initiative (MSI) and small reductions will be made to other municipal grants. Alberta’s transfers to municipalities will remain above the national average. As we bring our budget into balance, and as the expiry of MSI approaches in fiscal year 2021-22, funding arrangements with municipalities will be reviewed. Through the city charter discussions, we have been working with Alberta’s two largest cities on a long-term revenue-sharing formula that will support their continued growth and recognizes the unique opportunities and challenges they face. In addition, the government recognizes the invaluable contributions that cities, towns and counties of all sizes have on the quality of life of Albertans and economic diversification opportunities they create. New funding arrangement discussions will begin with municipalities large and small. Pending those agreements, the government will aim to make legislative changes this year to have a new system operational by the time MSI is set to expire. Building on the $3 billion we have already committed in LRT funding, we will also work with Edmonton and Calgary to establish a long-term provincial transit investment plan that will support growth in the cities and the surrounding regions. Alberta’s best days are ahead of us, not behind us. As we come out of this recession and keep our province on a responsible path to a balanced budget, we do so surrounded by new signs of hope and determination. Albertans are united behind our efforts to get a new Canadian pipeline built to the Canadian coast. Our kids are getting high-quality education in great public schools. Our loved ones are getting world-class health care in modern hospitals. Our streets are safer with more police and new supports to fight crime. More education and training will mean more Albertans have the skills they need to get good jobs. More affordable housing is helping more people put roofs over their heads and new dreams within reach. More kids are getting nutritious meals at school. And, Mr. Speaker, more jobs are being created and more Albertans are working than ever before. When the recession hit, we made the choice to put the priorities of ordinary people first. We are going to keep putting ordinary people first. To those Albertans who have yet to experience the recovery, who are counting on us to do more, we will stand up for them, together, always. We are going to keep fighting to make sure that this economic recovery is built for working people and built to last.